In our world today the English language has become a necessity for communication.Even in the Japanese society the importance of the English language has been brought up to everyone’s attention. We use our curriculum to take out the individuality of each child. 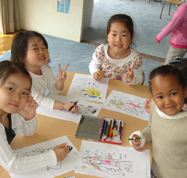 Our goal is to have each child write, speak, communicate in English in their everyday life. We have been successful in having our children enter their first choice of schools (International schools, Japanese Private schools, etc).For all the children who have graduated our school, we have been able to maintain their English level by group lessons and private lessons. In this way our children are ready for challenges and have global skills. Our ultimate happiness is to see the children progress and grow. Please come and visit our school any time and see the beautiful smiles and amazing English level of our children. In our curriculum we also introduce 2 digit addition and subtraction. We also have our children work with word problems in English. The children are also introduced to different styles of Arts and Crafts.